Day Eight of the Novena to Saints Louis and Zelie Martin, for Monday, July 11, 2016 - "The House of the Father"
How can the Mass for the first feast of Louis and Zelie Martin as Canonized Saints be celebrated on July 12, 2016? With the approach of July 12, 2016, the first feast of Louis and Zélie Martin as canonized saints, I have received a number of inquiries about how to celebrate the Mass. [Disclaimer: I don't speak for the authorities of the Church, so please consider the information below as a fraternal attempt to answer these inquiries with the information I have, not as an official communication from any ecclesiastical authority]. After their beatification in 2008, a Mass for the blesseds began to be offered in France. It is dated “Lisieux. October 20, 2008,” two days after the beatification. I thank the Shrine at Alençon for posting it. You may see the text at http://louiszeliemartin-alencon.fr/wp-content/uploads/2015/10/Messe-des-bienheureux.pdf I believe that it was authorized for use in certain dioceses in France, but I can’t say exactly where. The Shrine at Alençon confirmed to me recently that the Mass for the feast of Louis and Zélie as canonized saints has not been approved by the Church even in French. I believe that, sadly, it may take a long time for translations into other languages to be approved. When will the feast of Saints Louis and Zélie Martin appear on the liturgical calendar in the United States? The optional memorial for Sts. Louis and Zélie Martin on July 12 does not presently appear on the 2016 or 2017 calendars of the United States Conference of Catholic Bishops. I do not know how long it will take for this to happen. St. Therese was canonized in 1925, and Pope Pius XI extended her feast to the Universal Church in 1927. I hope that the Church will soon recognize that, even though Louis and Zélie were French nationals, their status as the first spouses canonized as a couple and as the parents of St. Thérèse, Doctor of the Church and patron of missions, makes their feast of international significance. How can the Mass be offered for the feast of Sts. Louis and Zélie Martin now? An American liturgist whom I consulted suggested that to celebrate the Mass for their feast, one might use the Common of Holy Men and Women, but insert the names of Sts. Louis and Zélie in the prayers. Thanks to the kindness of don Riccardo Brena and the parish of Marcallo in the Archdiocese of Milan, you can order reproductions of their icon of the Martin family through Trinity Stores Religious Artwork and Icons in Colorado. This icon by Paolo Orlando, shows Louis and Zelie Martin with their five adult daughters dressed as nuns. From left, Marie and Pauline as Carmelite nuns; Leonie, whose cause was introduced in July 2015, as a Visitation nun; Celine and Therese as Carmelites. Near the parents are the four little ones who died very young: Marie Helene, Marie-Joseph-Jean-Baptiste, Marie-Melanie-Therese, and Marie-Joseph-Louis. The icon is available in many sizes and formats: holy cards and prayer cards, magnets, framed desk art and wall art, giclee prints, and wooden plaques. You may also order the icon on devotional candles, T-shirts, and sweatshirts. Some of the available sizes are quite big enough to be installed in churches and monasteries; you may also order custom reproductions. Purchases through this link support this Web site. Thank you. Please click on the image of the icon of the Martin family above or click on "Sts. Louis and Zelie Martin with St. Therese of Lisieux and Siblings." At upper left, you will see a box that says "search for art." Type in the name "Orlando" and press the search button. The icon will appear. Choose among sizes and formats. Louis and Zelie and their children gathered every night to pray before the statue of the Virgin of the Smile. I hope this icon of the Martin family will become a center of prayer in many homes, churches, and monasteries; will make the new saints known and loved; and will be a window to the holy. Consider ordering it to celebrate the canonization; for the feast of Sts. Louis and Zelie; for a wedding or anniversary gift; or for a Christmas present. I hope that many churches dedicated to St. Therese will install this icon to honor Louis and Zelie and to remind the people that Therese did not fall out of heaven as a completed saint, but was brought up in a holy family. I would also like to see donors appear to give the icon to many Carmelite monasteries and monasteries of the Visitation. Please pray that God attracts many souls through this sacred art. Thank you. The stained-glass window dedicated to the Martin family in the church of St. Symphorien des Bruyères in the province of Orne, France. On Saturday, May 24, 2014, at 11:00 a.m., Mgr Jacques Habert, bishop of the diocese of Séez, will preside at a Mass of thanksgiving for the restoration of the Church of St Symphorien des Bruyères in the province of Orne. Then he will bless the three new stained-glass windows in the church, including the window pictured above, dedicated to the Martin family. The window shows a scene from the life of the Martin family. 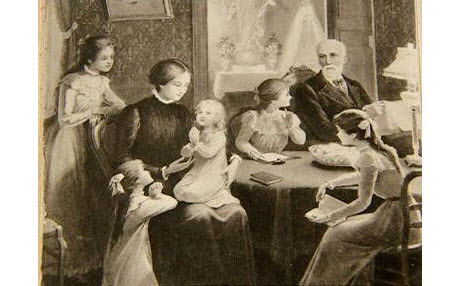 At left, Zelie is teaching her two youngest daughters to pray: Therese is on her lap, and Celine kneels in front of her. One of the older Martin daughters looks on. The other two are near their father, who looks on. At the top of the window can be seen the words "Martin Family" and, at the bottom, the words "All Called to Saintliness." The Shrine at Alençon informed me that the window is based on the painting above, which represents the Martin family at prayer. The family of Louis and Zelie Martin was chosen as a subject of the window not only by the Church but also by the mayor and the people of the commune of St Symphorien des Bruyères, a small municipality about an hour northwest of Alençon. We congratulate the commune and the Association for the Conservation of the Heritage of the commune for completing the restoration of this fifteenth-century church after ten years of work. You may see other photos of the church on the Web site of Atelier Touchard Architectes, which accomplished the restoration. May the life of the Martin family be a true icon for us. May we see their hardships and joys all now illumined by the light of Christ. May the light of their lives shine through ours so that they may obtain for us from God the same grace of seeing God in everything and everything in God. I thank the Shrine at Alencon (http://www.louiszeliemartin-alencon.com/eng/), which permits me to share with you the photographs and the story. A happy feast to Blessed Zelie and Louis Martin! As a feast-day gift to my readers, I have created a photo gallery today of my privileged visit, as a pilgrim to their beatification, to the house and garden at 7 rue Labbey where Louis Martin lived with his daughters Leonie and Celine after he was released from the Bon Sauveur psychiatric hospital at Caen. For the story of this visit and present-day photos of the house at Rue Labbey and of Isidore Guerin's house on Rue-Paul Banaston, please visit the photo gallery for Blessed Louis Martin's home at 7 rue Labbey.